We're looking for talented individuals to join the nation's largest and best towing and vehicle managment company. Join the best in the business in an exciting, fast-paced environment where you can thrive and make a difference! We are looking for confident, career-driven and talented individuals who are committed to success of our rapidly growing company. Download and complete form online, then save and upload application. Hint: The math problem below is developed in the form of characters/numbers. Utilize the image sample on the left for visual assistance. 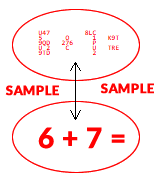 Do NOT attempt to read the small characters/numbers because it forms a math problem.